Edinburgh Capitals were right to part company with head coach Dmitri Khristich, according to former Great Britain ice hockey forward Derek Reilly, but are wrong to continue to keep fans in the dark as regards their on going off ice problems. Reilly, who had a 20-year playing career with the highly-successful Murrayfield Racers, is still heavily involved at Murrayfield as a commentator on Edinburgh’s home games for the club’s web-cast provider, Caps TV. Edinburgh appointed Khristich, who as a player was twice voted an NHL All-Star, in the summer and looked to be building a competitive team for the season ahead. However, Caps are heading for their worst-ever campaign in the Elite League, winning just three of their 24 games, and off the ice are going through a corporate restructure after previous owner Scott Neil’s company, Capitals Hockey Limited, was liquidated last month. 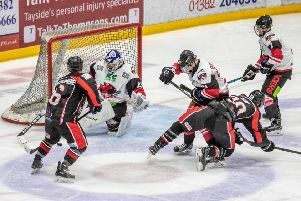 Caps parted company with Khristich on Monday, just 24-hours after a 7-2 home loss to Guildford Flames. Reilly said: “I thought things were poor from the beginning of the season and they just got worse. I feel for the coach as he has lost some important players along the way, but right now Caps are producing some of the worst performances I’ve seen for a long time. “What was going to be a really good season quickly capitulated and usually it’s the coach you would blame for something like that. Assistant coach Jock Hay, another former team-mate of Reilly’s, will split coaching duties with club captain Michael D’Orazio for the remainder of the season. Reilly continued: “I think it’s the right decision for the club and coach to part company and I’m pleased to see Jock Hay and the captain take on the coaching role. Hopefully they can get more from the players. It’s now about getting the team we have to give their best on the ice and get the fans back on board for the remainder of the season. “But there is a lot going on behind the scenes, it’s not a happy camp. “I feel sorry for Scotty, he’s been a great friend of mine for many years and we used to play together back in the day. I feel sorry for some of the players, you hear stories that they’re not getting paid on time and things like that. But first and foremost it’s the fans I feel sorry for. They should be kept up to date with what the club is going through, whether in the papers or in the match programme. But there has been no communication and to keep in the dark people who pay their money every week to support the club is just ridiculous. “The club has been run on a shoestring for a number of years. This season has just disintegrated and the crowds are getting less and less and it’s demoralising for everybody, but on top of that the club are hiding away from telling fans what’s going on and that needs to change. Meanwhile, Capitals have brought in Latvian forward Ainars Podzins, initially on trial. The 25-year-old arrives after a recommendation from recent Caps pick-up Nikita Kolesnikovs, who describes his style of play as similar to current hard-working winger Dylan Anderson. Podzins will make his debut on Saturday at home to Belfast Giants and joins from Russian second division club Metallurg Novokuznetsk, Podzins has also just under 100 KHL appearances to his name and has played in the Slovakian top flight as well as the lower leagues in Finland and Germany.